Last year I threw myself a birthday party and decided that it was so much fun I had to do it again. This year I decided to do a sit down dinner instead of last year’s appetizers and more casual affair. 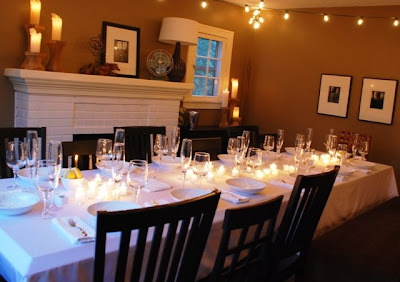 Beings that I live in a small house, my dining room was not big enough for my 14 guests, so I decided to put the dining table in the living room. I brought in the outdoor table and put it together with my dining table so we had enough room for everyone. I also hung some lights above the table and lit a ton of candles for ambiance. It turned out to be the perfect space for dinner! 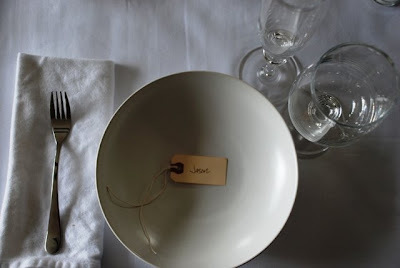 Here is a picture of the place settings…I used mailing labels as place card holders for everyone so they knew where to sit. They also double as a tag for their glass, so they wouldn’t lose it. 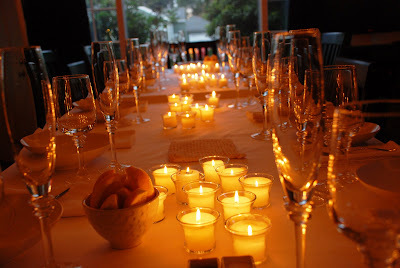 I had a box of votive candles I placed all over the table so we would have lots of candle light. For dinner I serve my yummy Paella, which had shrimp, chicken, chorizo sausage, mussels, rice, tomatoes, onion and garlic, you can find the recipe here. 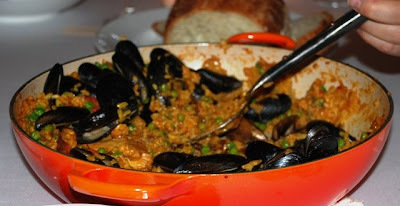 The traditional way to serve paella is on its own or with a loaf of bread, which I also did. 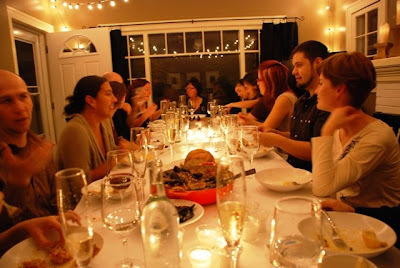 It was so nice to throw a dinner party and only have to worry about cooking one dish! Everyone had such a nice time sitting around the table, eating and chatting, and laughing a lot. Well you can’t have a birthday without dessert, right? I looked for some Spanish desserts and wasn’t really impressed with my options, so I decided to make a pumpkin cheesecake, since that’s one of my favorites. I made this last fall, and have been craving it ever since, you can find the recipe here. Also one of my friends brought a really delicious spice cake with cream cheese frosting, so it was the perfect ending to the night, two desserts! I received a couple of new cookbooks, which I can’t wait to write about and a finishing salt sampler which I have already broken into. Thanks everyone for making my 30th the best ever! 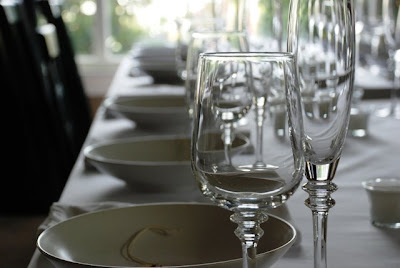 Your table looks spectacular! I like your idea with the gift tags. And I just love paella, this looks and sounds perfect. Well done, Jason. Happy Birthday To You Jason! May Good Luck Goes With You & Happiness Too! 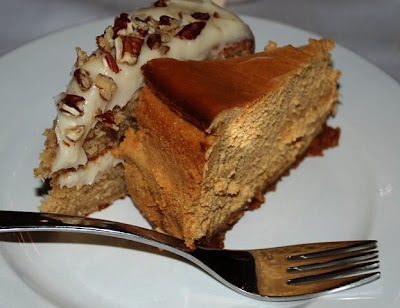 Your Pumpkin Cheesecake is a sure hit! I have 2.5 kg pumpkin sitting on my kitchen top that's making me wondering what to do with it besides soup, salad or what I normally did... Sangkaya Fakthong. Maybe a cheesecake version is a welcome change...:-) Problem is I can't find Graham Crackers in my local shops. I have to think of another way though. Thanks for sharing. What a wonderful birthdy party Jason. Your table was beautiful, I also love the paint color in your living room. What a perfect setting to celebrate getting older and wiser. The paella and cake look wonderful too - can I come next year? Hope it was a very happy birthday. Pixen...I almost used crushed up ginger snaps for the crust instead of the graham crackers, maybe those are easier to find? Happy Belated! That cake looks amazing!